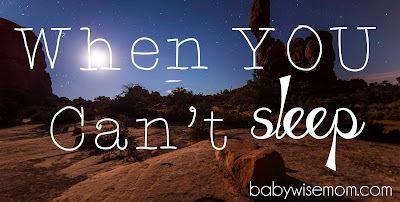 One of the most stressful things for me as a mom is when I can’t sleep at night. I want to get sleep while the getting is good, and yet there are moments when I just can’t sleep at all no matter what. I don’t want to be a grumpy mom, and being a tired mom makes it hard to avoid the grumpy. Here are some tips for helping yourself sleep better. There can be a lot of reasons you can’t sleep. A major reason for insomnia in women is hormone cycles. Each month, right before my period starts, I have a night of major insomnia. This is very regular, but it took me years to figure out the pattern. On that night, I know to just accept it. I don’t stress and I know I am just not going to get much sleep that night. I always had a very hard time sleeping when I had a newborn. I am a light sleeper anyway. Adding to that the crazy hormones and the need to listen for a baby in the night just made it so I slept even lighter. I would wake at every sound. I started to sleep with earplugs. I still could hear everything. I eventually moved to moving the monitor to the other side of the room, covering it with a pillow, and wearing ear plugs. I still woke at every chirp the baby made. This is something I moved away from as my baby started to consistently sleep through the night. I could finally rest without worrying about when the baby would wake up. I also had a hard time falling back asleep once I nursed the baby. I would start calculating. “If I fall asleep now, I should get 2.5 hours before the baby wakes back up.” I desperately wanted to sleep, but I had a hard time getting there. Remember that sleep begets sleep. An overly tired adult can have a hard time falling asleep just like a baby can. A major reason women have a hard time sleeping is that they have a hard time turning the brain off. I consistently hear from other women that if they get woken up too close to wake up time, they get thinking about what they have to get done that day and cannot fall back into dreamland. The trick here is to find a way to get your brain to stop thinking. You might find reading helps you do that. You might find watching the television helps you do that. When I hurt my ankle, I had to sleep with a large boot on for 6 weeks. It was not comfortable and it led to me sleeping in a lighter sleep state. I woke up in pain often and could not fall back asleep. We had always been against having a TV in our bedroom, but my husband knew from experience I often fell asleep watching TV, so he turned to the classifieds and bought a cheap TV to put in our room while I was healing. It worked very well! It helped distract my brain so I could go back to sleep. We liked it so much, we still have a TV in there. If you have a TV for this purpose, I highly recommend a TV with a timer so you can set the timer to turn the TV off after 30-60 minutes so it isn’t on while you are asleep (which will cause you to be in a lighter state of sleep). Adults benefit from a sleep routine just like a baby or child does. Interrupting the routine, for anyone, can make it harder for them to sleep. Having a routine is a great way to prep the brain and body for sleep. Make a routine and keep it. Exercising each day helps your body be ready for sleeping at night. Just like a child needs to burn energy to sleep well at night, an adult does, too. I have commented on a couple of things already. Sleep science is very helpful in helping you sleep better. Make sure your body gets natural light in the day to help with melatonin and circadian rhythm. Realize that you have an ideal time when you can fall asleep well at night. I have a ten minute window where if I go to sleep in that ten minute window, I fall asleep quickly and sleep deeper at night than I do if I go to sleep before or after that window. Expend enough mental and physical energy each day. Don’t eat foods before bed that will keep you up. Know if you sleep better with or without socks. Know what kind of bed you sleep best in and how you should dress at night. Experiment with house temperatures and blanket layers. Apply the science of sleep to not only your children, but to yourself also. Something helpful to know about insomnia is if you can’t sleep, it is good to get up and walk around for a few minutes. It is not helpful to lay in bed for hours, tossing and turning. If you have been trying to fall asleep for 20-30 minutes, get up and walk around for a few minutes and then try again. When I have a newborn, I have learned I just need to have some extra sleep help. My OB offered to give me a prescription strength sleep aid after I had Kaitlyn, but I didn’t want anything that could be habit forming. He told me to try Tylenol PM. I tried two pills a night for a while and it worked well! The trouble was that I needed more sleep than I normally do because of it. Where I am more of a 7-7.5 hour a night sleeper, I was needing 9ish. 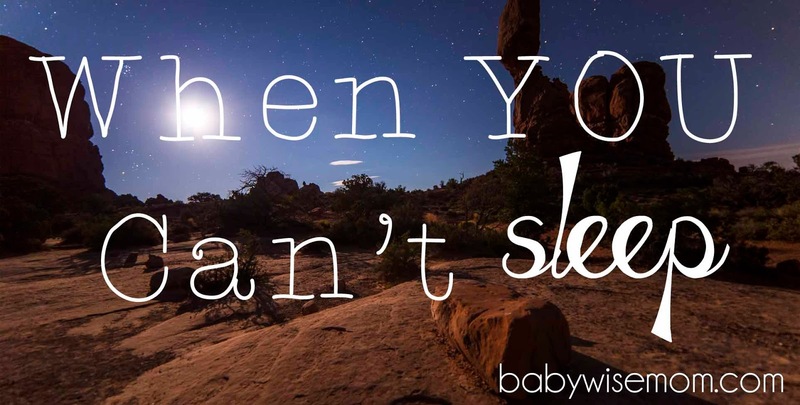 I didn’t like needing more sleep to function, especially with a newborn! So I went down to one a night. that was the right number. It was just enough to get me drowsy, but I could still function on less sleep. This post contains affiliate links. I took one Tylenol PM until I weaned my baby. Then I stopped taking the pill. It was not a problem to stop using it. You could also try melatonin and essential oils . In your quest for a good night’s sleep, just be cautious about what you introduce into your life. Just like a baby can develop a dependency on sleep props, so can you. Sleep begets sleep, so sometimes an aid can help you get back on track of sleep so you can get back to being able to sleep well once you aren’t overly tired. Once you are there, remove your sleep prop. What have you found helps you sleep? I am exactly like you about sleep. I have always been a very light sleeper, and I get so stressed out and tired when I have a newborn that I can't sleep. Once overtired, I really have a hard time. I do the same thing you do where I count the hours and get so frustrated if I don't fall asleep within 30 minutes. Thanks for all the tips. I will try Tylenol PM too if I have another baby. I was afraid to take it. I didn't know it was ok when nursing. I've never had problems sleeping until this past pregnancy (my 4th). I finally started taking Unisom (which is the same thing as Benadryl). Just half a pill each night made such a difference, wasn't habit forming at all, and didn't leave me groggy the next morning. It saved me! Stephanie, it is very helpful! Jennifer, that is a good idea! I took that during the day to help with nausea with two of my girls and it defiantly made me drowsy! I couldn't take it with Brinley because it made me too drowsy to drive and my life were old enough they were in activities. This post was so timely for me! I had my second daughter at the end of September. Suddenly 2 weeks ago, when she was a little over 2 months old, I developed a terrible insomnia. It was absolutely awful since I went 4 nights with basically no sleep at all. I laid in my bed for most of the night. It was beyond frustrating to be awake when my baby was asleep. I think, like you, I am on a high alert level when I have a baby. I was that way with my first as well (who is almost 5 years old now), but she slept through the night at 8 weeks old so my mind & body never went too long with the broken sleep. But my second is 12.5 weeks old now, and despite me following Babywise to a T (just like with my first), she finally has just slept through the night the last 2 nights. Hopefully it's a habit here to stay, but the verdict is still out. Regardless, even though the wake ups were just 20 minute nursing sessions every 3-5 hours, the anticipation of when she would wake up caused a lot of anxiety for me. This was the main contributer that led to the sudden insomnia. After 4 days of barely sleeping more than 2 hours in a night, I saw my obgyn who had me start medication for anxiety. He also has me now taking ambian for a few weeks to reset the horrible sleeping pattern. The crazy part is that even on ambian, I still hear my baby if she wakes. That high alert is still there, but I am finally able to sleep a good part of the night. If this insomnia happens to anyone in an extreme way like it did for me, I encourage you to see your obgyn RIGHT AWAY. After the week of little to no sleep, the exhaustion had taken over my body to the point where I could barely eat since my appetite was suppressed and I had such nausea and headaches. I also was starting to think I really did have a post partum depression since I was in such a miserable and hopeless feeling exhausted state. The more tired I got the less I could sleep too. Bottom line is you can't "make" yourself sleep, and anxiety over not sleeping only worsens the situation. This truly came out of nowhere for me, and I am so thankful to be slowly on the upswing from this horrible experience!